I know you're pressed for time right now, so I won't keep you long. You would make me EXTREMELY happy if you played the "Louise Loves Art" song for your students today. I think they would smile from ear to ear and feel inspired to create art and sing for the rest of the day. If you're one of the first five people to tweet a photo or a vine to @MrSchuReads of your students singing along to the "Louise Loves Art" song, I will mail you a copy of Louise Loves Art. Thank you! Thank you! Have a great day! Happy reading and singing! Cute! We will watch it this morning. Thanks for sharing. Showed it to my 7th graders and a student told me right away, "This will now be stuck in my head the rest of the day." Mission accomplished. This is just adorable! 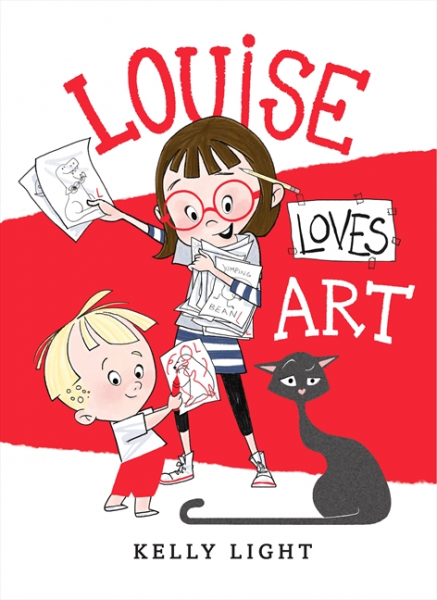 One of my favorite books of 2014, Louise Loves Art got way too little attention. This will correct that big time. Thanks so much for the link, Jon. Will play it forward. Literally. Kelly Light is an author and illustrator that has captured the hearts of little ones. Emily took her words and made them into a magical song that captures their attention and draws the children in. I am a grandma but Moms if you are in a store and can't get your toddler to sit still play the video. I did and the Mom thanked me. She wanted the book and the CD. I told her to read the story to him. Read a story everyday to him. There is no greater treasure then the books we hold dear from our childhood. It turns you into a Grandma who is still buying books. Love everything Emily does. Have had the leo a ghost story song in my head for months now.